Math Multiplication Games Are A Fun Wau To Learn To Multiply. 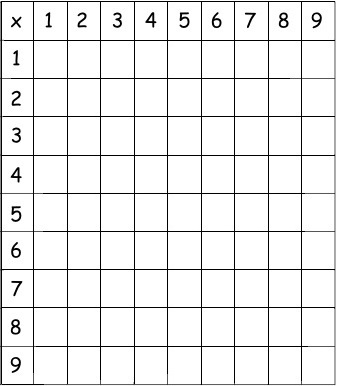 Playing fun math multiplication games with the kids will have them knowing their multiplication facts in no time! Players decide which color product cards they would like, either grey or white. Shuffle the cards and place the deck face down in middle of players. First player draws two cards from the top of deck. The player will then multiply the two numbers to find their product. If the player says the correct product on their first try, they will locate that product in their product cards and place the product card over that same number on the game board. - a Four of Clubs and an Eight of Hearts. She says the multiplication sentence aloud, "8 x 4 = 32". 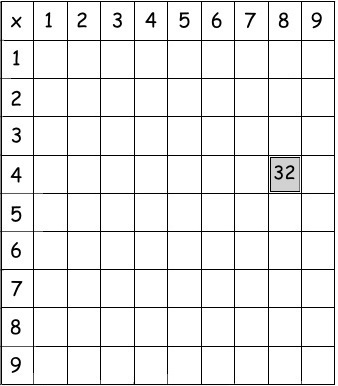 She then finds the 32 in her product cards and places on a square where the two factors, 8 and 4 meet on the game board. Player two takes their turn in the same way. Players continue taking turns in this way. If a product space is already covered on the game board, that player doesn't get to place a product card down and places the two cards in the discard pile. The next player takes their turn. A round is complete after all the cards have been used. After all cards have been used, one of the players shuffles the cards and places them face down again in the middle. Decide how many rounds will be played at the start of the game. When the games has completed the decided upon number of rounds the game is over. The player who has the most products covered is the winner!